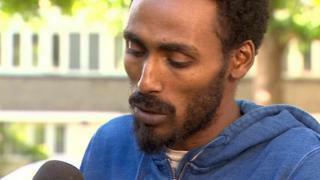 Mahad Egal and Jamie Murray and their two young children want to stay in the property, but Kensington and Chelsea Council has said it is “no longer suitable” and will not renew it. They moved into a permanent home last month, but within three weeks had returned to their temporary accommodation – which they first entered in August 2017. Ms Murray told the BBC’s Victoria Derbyshire programme that the permanent home had been connected to a building with aluminium decorative casing around the windows. But Ms Murray said: “We were given similar reassurances when we lived in Grenfell Tower. The family added that moving from one property to another with two children would be “stressful and unnecessary” and Mr Egal was reporting symptoms of post-traumatic stress disorder (PTSD). They said the next time they move, they want it to be their permanent “forever” home. Mr Egal told the BBC that “every day from now on is a potential eviction day” and he feared the effect it would have on their children. Local Labour MP Emma Dent Coad said the council saw some Grenfell survivors as “troublesome” and wanted to “clear the decks” before the second anniversary of the tragedy on 14 June.